Detectives are calling on the public to provide any information that may help with their investigation into the fires. Shortly after midnight, residents in the area surrounding the Waikiki Community and Family Centre reported hearing loud explosions and seeing flames. 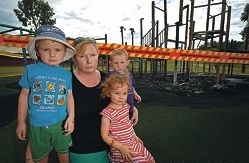 Department of Fire and Emergency Services officers attended and found playground equipment damaged by fire. The estimated cost of the damage is about $20,000. A second fire was found opposite the centre at Charthouse Primary School. A cubby house was damaged by fire, causing about $600 damage. People with information, particularly those who may have seen anything suspicious in the area, are urged to call Crime Stoppers on 1800 333 000.